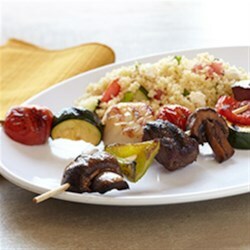 "Colorful skewers of bison sirloin steak, tender sea scallops, mushrooms, zucchini, and cherry tomatoes are grilled and served with a Greek-inspired couscous salad in this gourmet recipe." For brush-on, stir together oil, lemon juice, lemon zest, garlic, salt, and thyme in a small bowl; set aside. Thaw scallops, if frozen. Rinse scallops; pat dry with paper towels. On eight 10-inch skewers,* alternately thread scallops, cherry tomatoes, and zucchini, leaving 1/4 inch between pieces. On eight 10-inch skewers,* alternately thread bison sirloin steak pieces, mushrooms, and bell pepper, leaving 1/4 inch between pieces. For gas or charcoal grill, place bison skewers on the rack of a covered grill directly over medium-high heat. Grill for 8 to 10 minutes or until desired doneness, turning once and brushing with brush-on. Grill scallop skewers beside bison skewers for 5 to 6 minutes or until scallops are opaque, turning once and brushing with brush-on. Serve with Mediterranean Couscous Salad. Mediterranean Couscous Salad: Bring broth to boiling in a medium saucepan. Stir in couscous. Cover and remove from heat. Let stand for 5 minutes. Fluff couscous lightly with a fork. Transfer to a large bowl. Let stand at room temperature for 10 minutes. Stir in chopped tomato, cucumber, onion, and feta cheese. Toss with vinaigrette. Learn how to make lean bison and vegetable kabobs with couscous salad. *If using wooden skewers, soak in water for 30 minutes before grilling. The couscous salad was sensational!! And the bison was mouthwatering! I will be making this a lot this summer! Thanks for sharing it!